College Colors Day: Heather Wears UK Blue and White! I can't really remember a time when I didn't wear UK Blue and White. I was born into a family of fanatic Kentucky Wildcats fans. 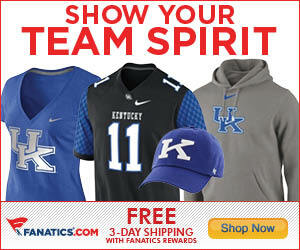 Come to think of it, I didn't really know that there are any other kind of UK fans. My family's history with the University of Kentucky goes back to the 1930s, when my grandfather and his siblings travelled from their rural Knott County home to Lexington to attend the University. I can't imagine how long it took to drive there, how difficult the journey must have been, or what campus looked like at the time. I do know that my granddaddy always had a unique perspective about UK; when I once mentioned visiting the Funkhouser Building, he let me know in no uncertain terms that he had not been a fan of the building's namesake. Construction of the M.I. King Library on UK's campus, 1930, via University of Kentucky. Like many Kentucky families, we are all Wildcat fans no matter where we matriculated. The University and the Wildcats are part of our family's story. Watching the games and cheering for the 'Cats -- Well, that's just what we do. My great-uncle recalls the Bear Bryant - Adolph Rupp years in great detail, my father can describe listening to the storied '66 Championship on a transistor radio, and I can even tell you who my very first favorite UK player was. I ran into this guy at the 2007 Music City Bowl. The Lilly Pulitzer UK Wildcat. My favorite thing in the history of ever. Today, on College Colors Day, I'm wearing UK Blue and White because that's what my family does. I'm wearing Blue and White because my fiancé and I collectively hold three graduate degrees from the University of Kentucky and because some of my favorite memories involve trips to UK football and basketball games. I'm wearing Blue and White because I always want my Wildcats to win. But, most of all, I'm wearing Blue and White because I can't really imagine doing anything else.